The San Antonio Lonestars won the 55 Division of the Rocket City Classic in Huntsville, Alabama. The SA Lonestars went 5-0 for the weekend and won the Championship 13-0 on Labor Day versus the Tuscaloosa Tornados. 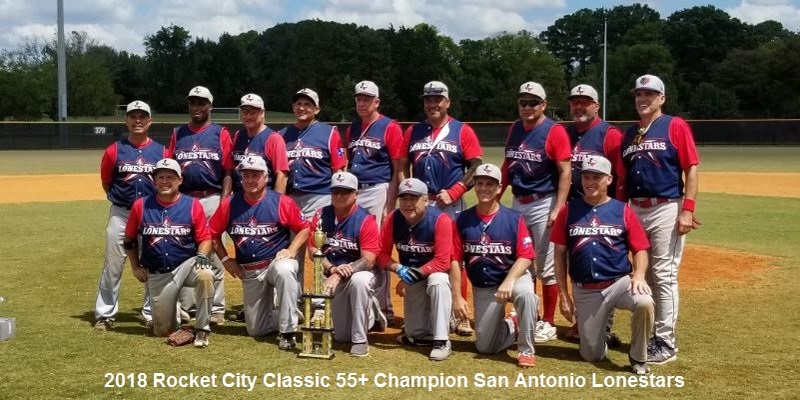 This victory avenged the SA Lonestars loss to the Tornados in the 2016 55 Championship game of the Rocket City Championship. The Lonestars scored 76 runs in their five games and gave up 19 runs during the tournament. The Lonestars had three MVP’s for the tournament: Alden Stiefel, Eddie Fuller and Sam Pacheco. Alden Stiefel was the “Iron Man” for the Lonestars on the hill, pitching complete games in both the Semi-finals and the Championship game. He gave up one (1) run in 18 innings, struck out 13 and only had seven (7) hits against him. An incredible performance!! The Lonestars hit .597 for the weekend. Their offense was led by Eddie Fuller, Tom Behringer, Adam Guzman, Mike “Hammer” Baskerville, Keith Thomas, Sam Pacheco, Jim Gonzales and Manny Ocampo. Eddie Fuller, Andy Bowie and Sam Pacheco also had standout defensive tournaments. They made play after play and wreaked havoc on the base paths on offense along with Tom Behringer. Walter De La Rosa and Sam Pacheco also pitched and picked up wins in the round robin play of the tournament. Walter De La Rosa also did the yeoman’s part of the catching duties for the Lonestars and was a rock behind the plate. Alden Stiefel was also behind the plate when he was not on the bump. The SA Lonestars are looking forward to returning and defending the crown in 2019. 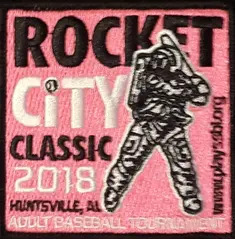 Huntsville is great city to play a baseball tournament in, it is a first class experience.